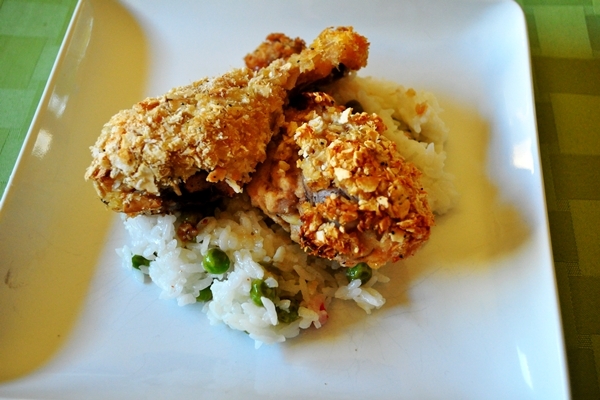 Everything from corn flakes to crackers has been used to make chicken crispy. But coconut and chutney not only give the drumsticks crunch, they make them sweet and spicy too. Chicken breasts, especially if they’re boneless and skinless, seem to be the most common way to make up a quick and easy chicken dinner. But the thighs and drumsticks are just as delicious and don’t get nearly enough attention. The thighs get a bad rap because they’re believed to be more fattening, and drumsticks only seem to come out for picnics. But what I’ve always loved about drumsticks is that they are not only full of flavor, but they seem to be the only part of the chicken (other than the meat-light wing) that it’s okay to pick up and eat with your hands. So, if you have a set or two of little hands that would rather do anything than use a spoon or fork at the dinner table, you (and Parents Magazine) know how valuable this type of recipe can be. Another great thing about the drumstick is that there are so many options when it comes to preparing them. They don’t just need to be fried or barbecued — they can be coated in just about anything and then baked for a deliciously fun dinner the whole family can enjoy. Place crackers and coconut in a large resealable bag. In a large bowl, mix together the chutney, lime juice and curry powder. Dip the drumsticks, one at a time, in the chutney mixture, and then place them in the resealable bag and shake to coat. Place the coated drumsticks in a large baking pan and cook in the oven for 30 minutes. Cover the pan with tin foil and bake for another 10 minutes or until cooked through. Serve immediately with a vegetable and rice.